Dave Splash Dot Com: Hypocrisy Alert!! Last week's tragic death of the 29 miners in West Virginia once again shined a light on the ridiculous lack of enforcement of federal and state safety rules. The Upper Big Branch Mine has been cited for safety violations thousands of times in the last decade, and more than 150 times in the last month. But with the teeth removed from nearly all safety enforcement mechanisms thanks to the Bush Administration and the Republicans in Congress (cuz safety is a socialist plot to destroy America), there is little that can be done without direct action from Congress (which includes the Senate, unfortunately, which means filibuster). But with just a casual glance at the safety records of mines with a unionized workforce vs. those non-union mines, you will see something glaringly obvious: union mines are much, much safer. Every single statistic shows this; but the ridiculous demonization of labor unions by the right and their friends in the media, has left people with a very wrong impression of the facts about unionized workplaces. "Was there no union responsibility for improving mine safety? Where was the union here? Where was the union? The union is generally holding these companies up demanding all kinds of safety. Why were these miners continuing to work in what apparently was an unsafe atmosphere?" 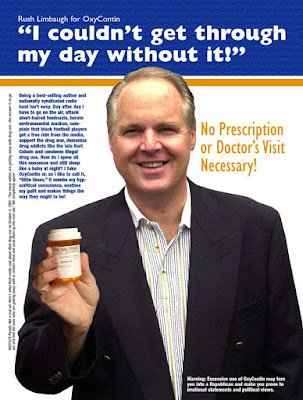 The problem with Limbaugh's comment is that the Upper Big Branch Mine is non-union. The CEO of the company Don Blankenship is a notorious union-buster, and has spent millions of his company's money in anti-union misinformation campaigns. The United Mine Workers have tried on three separate occasions to unionize Upper Big Branch (and 70% of the workers signed cards signaling support for the union), but Blankenship threatened to close the mine and fire all the workers if they went union. So, Rush, blaming the unions for safety issues at a non-union mine might placate the concerns for the brain-dead mouthbreathers who listen to your show, but it does nothing to address the real problem. You see, the workers at this WV mine had no idea their employer was cited for 150 violations last month. They kept on working, oblivious to the additional dangers, because they needed the work. But in a union mine, the workers would have known, and the safety issues would have to be dealt with in order to avoid a strike. Union mine = safety for workers. Non-union mine= death trap. I report, you decide. Great piece, Dave. Limbaugh is such a total douchebag. Huh. Let me see if I understand you. It's the media's fault because Rush Limbaugh blamed the unions for the disaster at the West Virginia mine, even though the mine in non-union and the mine owner is a notorious union buster? Makes no sense at all, amigo. But I guess that goes to explaining why you are a Palin supporter.